PASCAGOULA, Miss., Feb. 6, 2003 (PRIMEZONE) -- Northrop Grumman Corporation's (NYSE:NOC) Ship Systems sector has begun construction of DDG 100, the 50th ship in the DDG 51-class of Aegis destroyers. "This is an occasion of tremendous significance," said Dr. Philip A. Dur, Northrop Grumman corporate vice president and president of the company's Ship Systems sector, at a recent ceremony held at the company's Ingalls Operations here. "Northrop Grumman Corporation and its Ship Systems sector are proud of the relationship built with the Navy through the life of the DDG 51 program. This milestone event is built on cooperation, service and dedication to providing the Navy with the best surface combatant America can build." The company has delivered 17 Aegis destroyers to the Navy to-date, with delivery of the 18th set for Feb. 28. 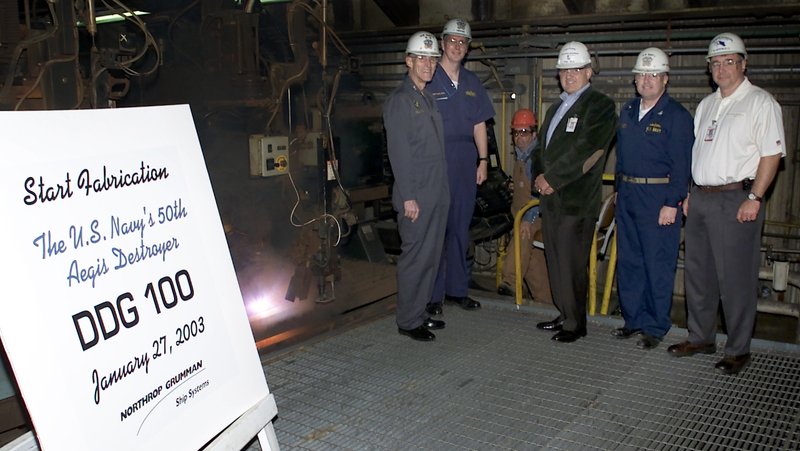 "The start of construction on DDG 100 represents many things," said Capt. Phil Johnson, USN, supervisor of shipbuilding, conversion and repair, Pascagoula. "The contractor continues to do an excellent job of building these ships and of recognizing the need to provide this type of surface combatant to the Navy as an important feature of our forces." Also on hand for the ceremony was Rear Adm. Curtis Kemp, USN, president of the Navy's Board of Inspection and Survey. Kemp sailed on two Northrop Grumman-built destroyers during his career -- USS Fife (DD 991), a Spruance-class destroyer, and USS Parsons (DDG 33), a modified Forrest Sherman-class ship. "The Aegis destroyers of today are such a marked contrast to the ships that I started on," Kemp said. "We're talking about the difference in going from the basics of a train to a modern-day rocket ship. The technology that will be in DDG 100 will be another quantum leap from that. We're going in the right direction and it's very impressive what Northrop Grumman Ship Systems is doing here." Northrop Grumman's Ship Systems Sector includes primary operations in Pascagoula and Gulfport, Miss. ; and in New Orleans and Tallulah, La., as well as in a network of fleet support offices in the U.S. and Japan. Ship Systems, which currently employs more than 17,000 shipbuilding professionals, primarily in Mississippi and Louisiana, is one of the nation's leading full service systems companies for the design, engineering, construction and life cycle support of major surface ships for the U.S. Navy, U.S. Coast Guard and international navies, and for commercial vessels of all types.